As a callow biochemistry student, I often grappled with the onerous task of memorizing metabolic pathways. Gradually, however, I came to appreciate the underlying simplicity: Complex macromolecules are broken down to the same simple molecule. Metabolism is the workhorse of the cell — efficiently mining nutrients for energy, shunting surplus nutrients to build cellular structures, and storing away nutrients for times of scarcity. While scientists had long appreciated the importance of metabolism, the revelation that a mutation in a metabolic enzyme, IDH1, could potentially cause cancer came as a surprise. A study in 2008 discovered IDH1, a mutation in the enzyme that was prevalent in glioma patients1. Specifically, patients with secondary glioblastoma and gliomas, a subtype that typically progresses from less severe early stages (stage I, II, III glioma), were far more likely to harbor this mutation. Later studies showed that this mutation produced an oncometabolite — 2-hydroxyglutarate — distinct from the product of the wild-type, or un-mutated, form of the enzyme. This oncometabolite had surprisingly wide-ranging effects on the cell: It caused epigenetic re-programming — i.e., it pushed the cells into a primitive, less differentiated state, which is more characteristic of cancerous growth2. It also induced production of the protein HIF1-α, a factor that enables tumor survival in low oxygen conditions3. While the IDH1 mutation aided glioma formation, it was not sufficient to form tumors on its own. It needed to partner with more “traditional” cancer-associated mutations in genes such as p53 — which is already well-characterized as playing a key role in tumor progression. While the IDH1 mutation clearly contributed to the formation of tumors, paradoxically enough, patients with this mutation often fared better than their wild-type counterparts. This is partly because 2-hyroxyglutarate also severely incapacitates cellular metabolism — so much so that it reduces cell growth and proliferation4. So, the tumor-promoting effects of 2-hydroxyglutarate appeared to be essentially trade-offs with cellular fitness. The recent study published in Nature Medicine is the first to explain why the IDH1 mutation may be advantageous to cancer despite its deleterious effects on the cell5. This study also explains why the body’s immune system, which should recognize the mutant IDH1 molecule as “foreign,” fails to do so. Surprisingly, IDH1 mutant tumors manage to inactivate the immune system. The authors observed that the toxic metabolite 2-hydroxyglutarate is extruded by cancer cells (likely due to its toxicity) and is taken up by T cells, a principal arm of the immune system. Here, it impairs the activity of NFAT (nuclear factor of activated T cells), a protein that is essential for T cell activity, and effectively suppresses anti-tumor immunity mediated by these cells. The authors observed that mice with IDH1-mutant tumors responded better to a combination of IDH1 inhibitors and anti-PD1 treatment, a type of immunotherapy — this provided evidence for potential novel treatment combinations in humans. This study may have important implications for the treatment of glioma patients with IDH1 mutations, as well as treatment for other cancers in which an oncometabolite is produced. The effects of immunotherapy alone may be stymied by the immune-suppressive effects of the oncometabolite, so a combination of IDH1 inhibitors and immunotherapy will likely equip patients’ immune systems to better recognize and kill the tumor. 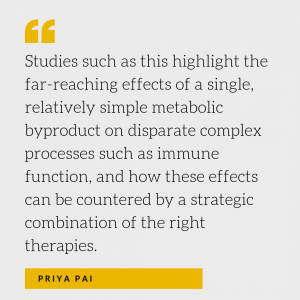 Studies such as this highlight the far-reaching effects of a single, relatively simple metabolic byproduct on disparate complex processes such as immune function, and how these effects can be countered by a strategic combination of the right therapies. Parsons DW, Jones S, Zhang X, Lin JC-H, Leary RJ, Angenendt P et al. An integrated genomic analysis of human glioblastoma multiforme. Science (80- ). 2008 26;321(5897):1807 LP-1812. Turcan S, Rohle D, Goenka A, Walsh LA, Fang F, Yilmaz E et al. IDH1 mutation is sufficient to establish the glioma hypermethylator phenotype. Nature. 2012 15;483(7390):479-83. Zhao S, Lin Y, Xu W, Jiang W, Zha Z, Wang P et al. Glioma-derived mutations in IDH1 dominantly inhibit IDH1 catalytic activity and induce HIF-1α. Science (80- ). 2009 10;324(5924):261 LP-265. Cui D, Ren J, Shi J, Feng L, Wang K, Zeng T et al. R132H mutation in IDH1 gene reduces proliferation, cell survival and invasion of human glioma by downregulating Wnt/β-catenin signaling. Int J Biochem Cell Biol. 2016 1;73:72-81. Bunse L, Pusch S, Bunse T, Sahm F, Sanghvi K, Friedrich M et al. Suppression of antitumor T cell immunity by the oncometabolite (R)-2-hydroxyglutarate. Nat Med. 2018;24(8):1192-203.